Old swimming pool at Camp Creek? 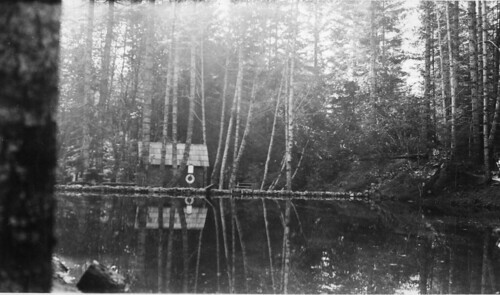 I came across this undated photo which was simply labeled "Swimming Pool - Camp Creek Forest Camp." Re: Old swimming pool at Camp Creek? I camp there occasionally. Haven't noticed any swimming pool. There are some private cabins near-by on the creek, maybe there? A number of times when I was in grade school, I swam in that swimming pool. It had log sides and was really cold. I think it was Camp Creek water passing through. Mostly we inner tubed because of the cold water. The grandmother of a friend of mine (the late Ron Funk, US Ski team member and star of the movie "Last of the Ski Bums") had a cabin on the Zig Zag not too far from Camp Creek Forest Camp. When we wanted to swim, Ron would try to talk Gramma into driving us up to Swim where the water was warm. Jack Grauer's book indicates that when the concrete pool at Swim was first built, there was some uncertainty whether the water was naturally warm from warm spring water or if the proprietor of the resort heated it. The resort was long gone when I was there and the water was warm. If Gramma wouldn't drive to Swim, we toughed it out a Camp Creek. I don't recall seeing anyone else there. I love stories like that. Thank you. I'd be interested in knowing what years you swam in this pool at Camp Creek. In the mid sixties we had a cabin just East of Camp Creek and spent a lot of time in the camp ground. I don't remember a pool there. There is a marshy area at the north end of the camp ground where there is a small stream that flows into Camp Creek. I'm wondering if this isn't the location of the swimming hole. I'd be surprised if they had damned up Camp Creek. I couldn't specify firm dates but it would have been between 1945 when WW II was over and gas rationing ended and 1947, the summer before I finished grade school. Perhaps the pool was a victim of road construction. When I started skiing with the Boy Scouts in 1947 we stayed at the Boy Scout Cabin at Twin Bridges which was in the same general area as the pool. The Twin Bridges are long gone. I don't know about the Boy Scout Cabin.